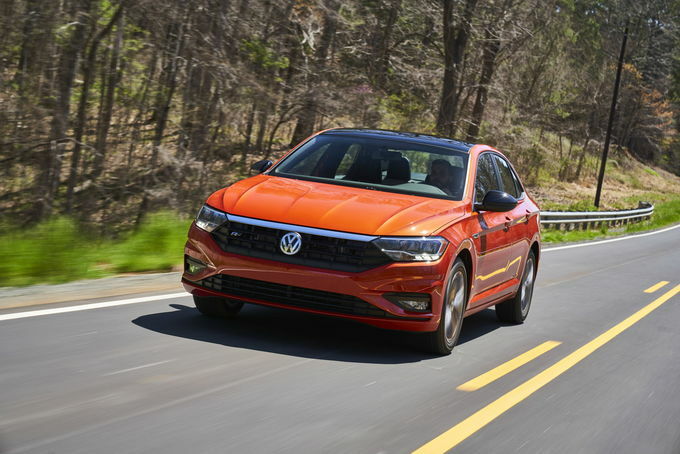 All-new this year, the 2019 Volkswagen Jetta offers clean proportions, a wide range of safety features, excellent fuel economy, and a generous warranty. But it breaks little new ground with a conservative design, uninspired handling, and front seats that offer a surprising lack of support. 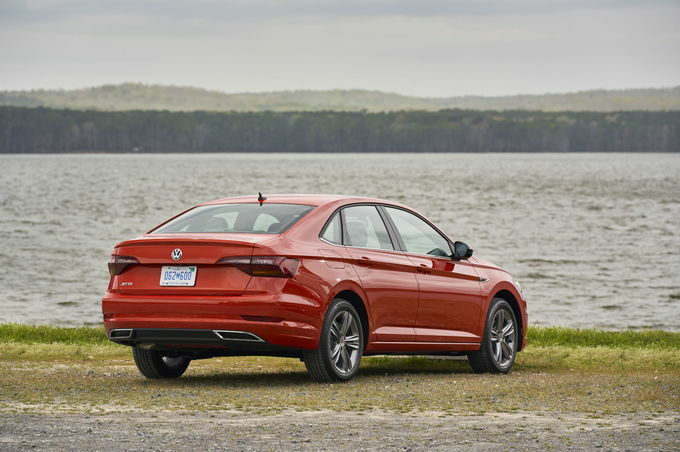 The 2019 VW Jetta starts at $19,395 for a manually-equipped S model and tops out at $27,795 for the SEL Premium. Between those two are three additional models – SE, R-Line, and SEL. A single engine is offered – a 147-horsepower, 1.4-liter turbocharged four-cylinder fitted with either a six-speed manual (standard on the S), or an eight-speed automatic (optional on the S, standard on other trims) transmission. The usual power features are present, plus LED headlights, taillights, and daytime running lights, 16-inch alloy wheels, automatic headlights, an electric parking brake, a 6.5-inch touchscreen, Bluetooth, a rearview camera, and generous six-year/72,000-mile basic and powertrain warranties. Blind-spot monitoring with rear cross-traffic alert, forward collision warning, and automatic emergency braking are optional on the S and standard on SE and above trims, while adaptive cruise control, lane keeping assist, and automatic high beams are standard and only offered on SEL and SEL Premium models. 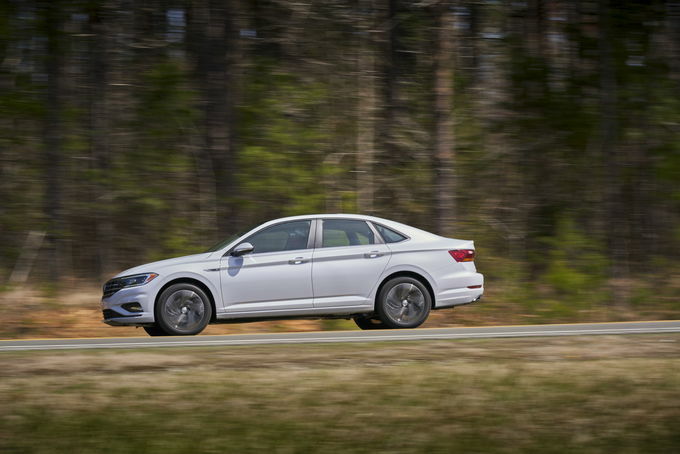 The Jetta delivers a smooth ride with a suspension that emphasizes comfort, and steering that's precise and nicely weighted. The standard 1.4-liter turbocharged four-cylinder delivers excellent fuel economy and strong initial acceleration with maximum torque available at a very usable 1,400 rpm. It pairs well with the eight-speed automatic found on most models, while the six-speed manual on the S trim features crisp shift action and a light, easy clutch. The soft suspension does a nice job of handling pockmarked roads, while SEL and SEL Premium models offer four drive modes that, when set to "sport", firms up the steering nicely on curves. Wrapping it up is excellent fuel economy with an EPA-estimated 30 miles per gallon city, 40 mpg highway, and 34 combined, regardless of model or transmission. But a brand that used to advertise "Drivers Wanted" offers a six-speed manual only on the base S, although even that doesn't turn the latest Jetta into a corner carver. Chalk this up to a simple torsion-beam rear suspension that doesn't allow the wheels to operate with the same independence as the multi-link setup on the Golf, and prioritizes comfort over handling, as well as a turbo-four that puts out a mediocre 147 hp. Adding insult to injury is a "sporty" R-Design that's only set apart by an electronic differential that distributes power more efficiently between the front wheels during cornering – an easy task considering the Jetta's softly sprung chassis and dearth of horsepower. 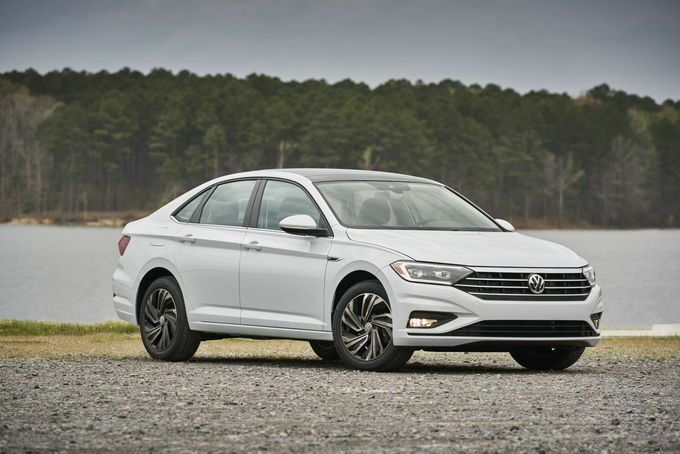 The Jetta's clean, elegant sheetmetal gets a mild boost this year with standard LED headlights. SEL models receive higher-tech LED projector units and halo-effect running lights. The look – most effective when draped in Habanero Orange – is wrapped around a tightly-assembled interior with enough space for four adults – and even a fifth in back without too much discomfort. Leg room in back is still generous but down slightly at 37.4 inches, head room remains at 37.2 inches, while access is easy thanks to wide doors. On the flip side, the tough cloth trim festooning S models impresses more than the real hides on the SEL Premium and synthetic skins adorning the rest of the lineup. The center console digs into leg room up front, where VW has eighty-sixed the lumbar support on all trims but the SEL Premium. Finally, trunk storage is acceptable at 14.1 cubic feet, but lacks the flexibility of hatchbacks, increasingly popular crossovers, and VW's own Golf. 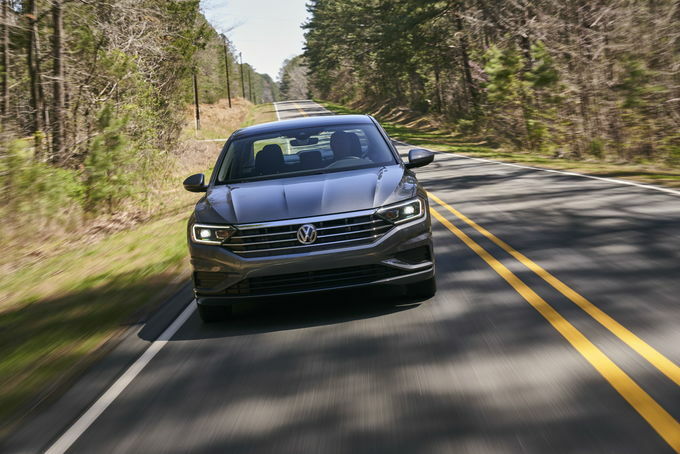 The new Jetta's smooth ride, excellent fuel economy, and advanced safety features make it a contender in its class, but we're disappointed with the bland design and mediocre performance and handling. The Jetta's safety systems, smooth ride, and top-notch fuel economy should attract safety-conscious families. At the same time, enthusiasts are sure to be turned off by the new model's middling ride, performance, and handling. 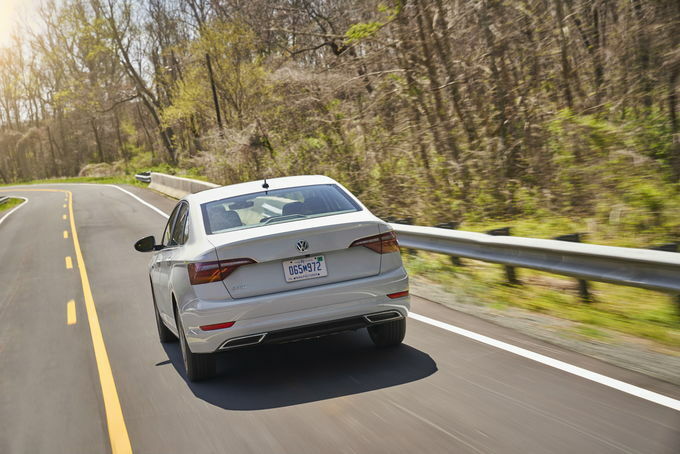 Volkswagen rings in the newest Jetta with a wide range of advanced safety features, excellent fuel economy, and generous warranties to back it all up. 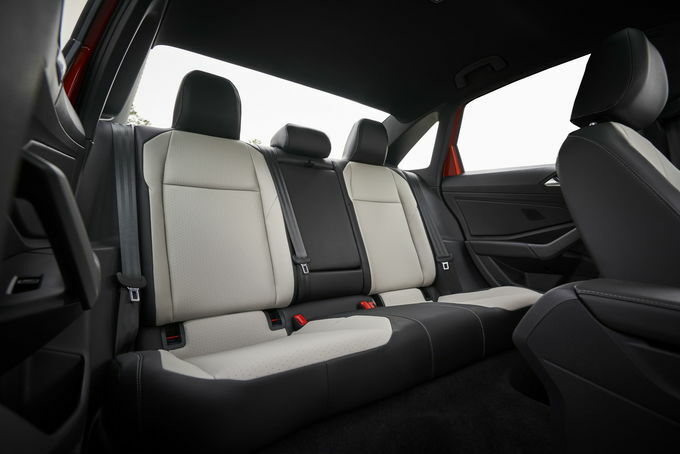 But the 2019 VW Jetta falls short with a pair of unsupportive front seats and so-so performance and handling, placing it just mid-pack in its class.